Mayhew Cabin was built in Nebraska City, a known “free town” along the Lane Trail, a route used by freedom seekers attempting to reach Iowa after fleeing Missouri. Among the city founders, Allen B. Mayhew and his wife Barbara and their children came to Nebraska Territory in 1854, from Warren County, Ohio, where they were born. They established their pre-emption claim, built their cabin in 1855 and engaged in farming. They constructed their cabin home with square hand-hewn logs from native cottonwood trees. Their involvement with the Underground Railroad was a result of the influence of Barbara Mayhew’s younger brother John Henry Kagi. Kagi had taught in Virginia in 1854-1855 until forced to leave because of his abolitionist views. From Virginia he came to live with his sister’s family in 1855 until he moved to Kansas Territory and took up the antislavery cause, eventually meeting abolitionist John Brown. During the tense and violent period in Kansas after the Kansas-Nebraska Act of 1854, Barbara Mayhew’s brother often stayed at the Mayhew cabin. Edward Mayhew, the eldest son of Allen and Barbara Mayhew, recalled in an 1890 letter to a newspaper that his uncle, John Henry Kagi, brought fourteen African Americans to the house where they were fed breakfast and only escaped capture because the pursuing men from Missouri realized Kagi was armed. An 1894 book on Brown and his men contains George B. Gill’s recollections about staying with the Mayhews in 1859. When George B. Gill, an Underground Railroad participant working with John Brown in Kansas, stayed overnight he had been with John Brown and John Henry Kagi who were headed to Iowa. Gill fell behind and because of the cold sought out the Mayhew cabin before catching up with John Brown and his party. When he left, he escaped capture by a marshal’s posse by fifteen minutes. Once John Henry Kagi died in John Brown’s Raid on Harper’s Ferry in October 1859, the Underground Railroad activity stopped at the Mayhew Cabin. Allen and Barbara Mayhew remained in Nebraska City and had six more children. Allen Mayhew farmed, made wine, and sold homemade brooms. In 1862 he made a fatal trip to the Northwest’s Snake River Valley pursuing gold. After his death his wife moved and sold the cabin. She married again and died in 1882. 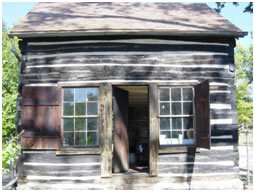 The Mayhew Cabin has remained open to the public since 1938. It became a popular tourist attraction that enthralled thousands of visitors each year. The myths and folklore already surrounding the cabin grew. Despite the folklore, the cabin does have a documented association with the Underground Railroad. The Mayhew Cabin is located at 2012 4th Corso, Nebraska City, Nebraska. The site is open May through October, Thursday through Sunday, 9 am -5 pm, and by special appointment. There is an admission fee. For information call (402) 873-3115.